Guatemala is a small vibrant country in Central America located just below south-west Mexico and also bordering Belize, Honduras and El Salvador. 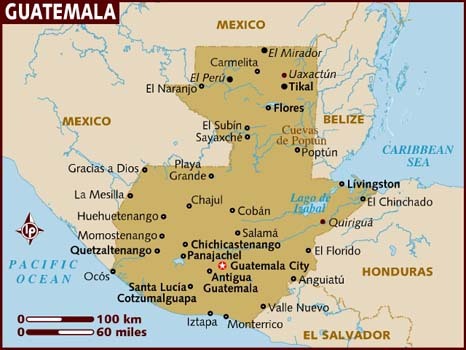 Guatemala is Spanish speaking country with a large indigenous Maya population still living much as they have for hundreds of years. Guatemala’s diverse geography boasts 33 volcanoes, highland areas, cloud forest, rainforest and even desert. The country offers visitors a unique cultural experience as well as access to some of the world’s most stunning scenery. Guatemala is a perfect destination for travelers that are looking to take a step back in time or those wanting to explore hidden gems and off the beaten path adventure.